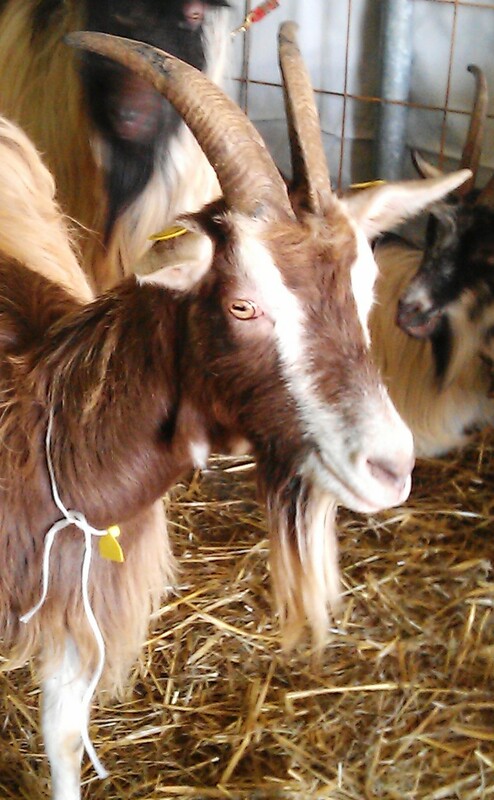 I thought I’d take a different slant on St. Valentine’s Day this year…and focus on Goats! Not in a romantic way I hasten to add..…but because it happens to be Chinese New Year on February 19th and we enter The Year of the Goat – with its potential of bringing us more peace and harmony. We can but hope! 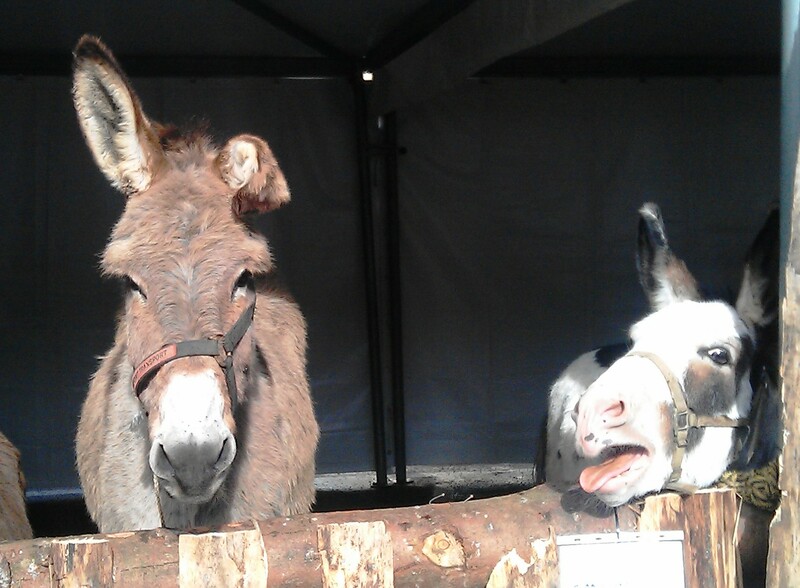 Peace and harmony however were not on the agenda at the Goat & Donkey Fair (La Fiera delle Capre e Asine) held in a nearby mountain village last weekend. We jostled our way through noisy, narrow streets lined with stalls of cheeses, salamis and wine; traditional wooden tools; everything for the home cheese-maker; sturdy alpaca socks; shepherds’ flowing black capes and brass polenta-making pans. The air meanwhile was being blasted by hundreds of bleating goats and hysterical braying from the donkey section where a race was due to begin. This guy on the right was the main noisy culprit and made it abundantly clear why the left ear of the other was permanently bent! Watch this fun YouTube video to get an idea of the noisy Goat Fair! : “Funny Goats Screaming Like Humans”!! 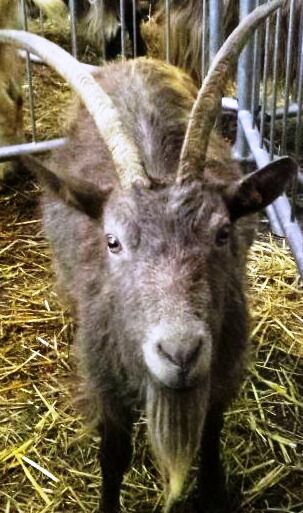 Of course I loved the fair and enthusiastically bought up loads of goats’ cheese, it’s the least ‘fatty’ of the cheeses and as long as it’s not too ‘goaty’ I can eat any amount of it. 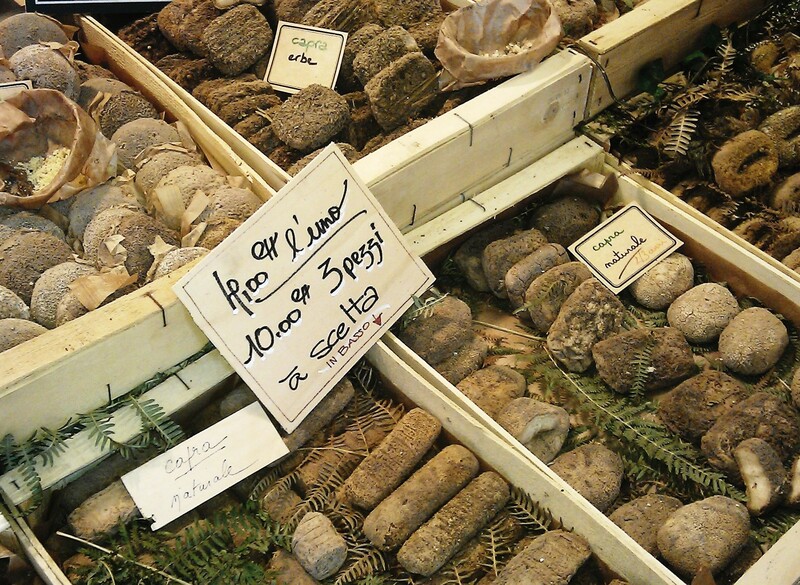 I’m using some of it for my ‘stuzzichini’ – Italian nibbles to have with an aperitivo….which being Valentine’s Day will be a chilled bubbly Prosecco. I’ve adapted a traditional local mountain dish called “Sciatt “– with the unfortunate pronunciation of “shat”! – made from cubes of ‘bitto’ cheese dipped in a batter of gran saraceno or buckwheat and fried. I wanted to keep things ‘light’ so have abandoned the frying part and substituted the buckwheat batter with a crisp, savoury cracker and the traditional ‘bitto’ cheese (a mixture of cow and goats’ milk) for a light, creamy goats’ cheese. Cheeses here are often decorated with herbs, leaves or wild flowers so, for St. Valentine’s day, I’ve pressed some dried rose petals onto the cheese! 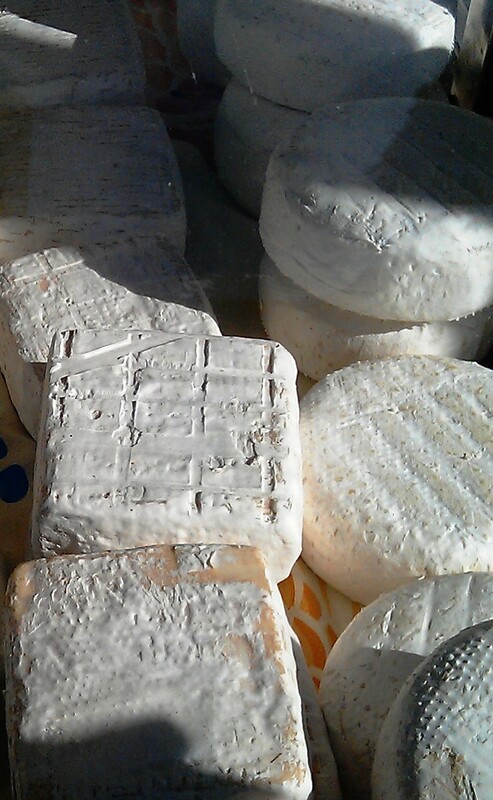 Creamy, soft goats’ cheese – I used a small 80g cheese, but you could double this which would probably serve 4 people. Put the flour and salt in a food processor and add the olive oil, pulsing a few times to mix. Remove the dough and put into a bowl. With your hands lightly and quickly knead the mixed seeds into the dough. Wrap in cling film and chill in the fridge for about 1 hour. Roll out the dough on a floured board until very thin – about 1mm thickness. Cut out shapes (I used a heart cutter) and place on a light greased baking sheet or on some greaseproof paper on a baking tray. Bake for about 10 minutes or until lightly browned and crisp. Remove and cool on a rack. Mould your goats’ cheese into any shape you wish (I used my same heart pastry cutter for moulding). 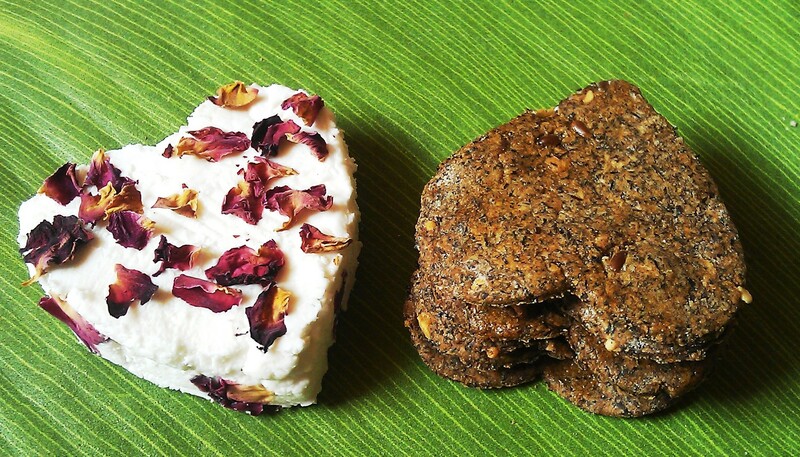 Press dried rose-petals or any dried edible flower onto your cheese. Serve with the crackers and a glass of Prosecco! Buckwheat, one of the so-called superfoods, is actually a fruit seed not a grain but can be ground into a flour (light or dark – the dark being more nutritious) to be baked. • Gluten-free (you could leave out the stone-ground white flour I’ve used to lighten it and make the amount of buckwheat flour up to 130g – you will probably need more water to make the dough.